The Palmyra Improvement Association is a little over a year old, but they’re already making a big splash. 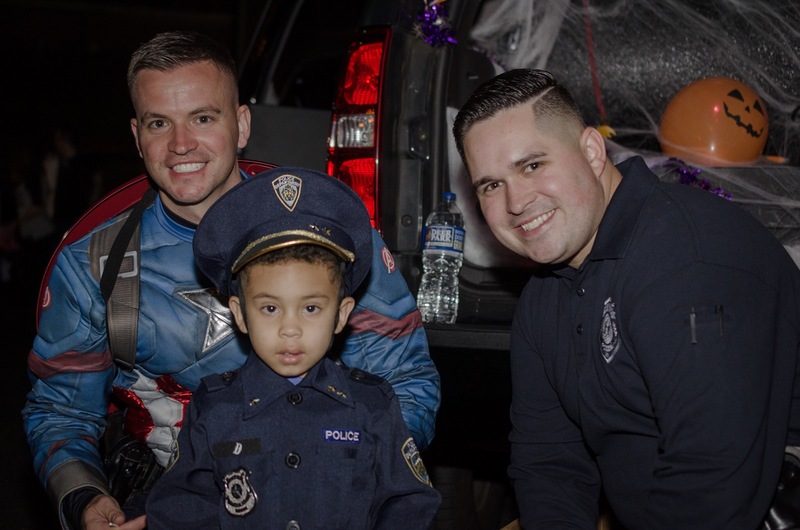 This past Friday they organized Palmyra’s first “Trunk or Treat,” which was a great success 1. What made this event so remarkable, however, was the amount of time it took to organize and run. The idea to hold a Trunk or Treat was first floated only a few weeks ago. Two of Palmrya’s Finest post for a photo with their future chief. I’ve been pondering what has made both the PIA and another support association, The Palmyra High School Foundation for Educational Excellence, so successful in such a short amount of time 2. It comes down to pride. Palmyra has a proud history and, while it’s been overshadowed by larger towns over the past few decades, a sense remains that Palmyra is a great town in which to live and grow. Pride can take a negative form which becomes lost in nostalgia, expressed as a “who needs them” attitude toward shifting cultural preferences 3. Like all human societies Palmyra has not been immune from this less helpful expression, and in years past it has stunted the town’s ability to move forward. What I’ve witnessed over the past few years, however, is a refocusing of this pride into a more positive direction. Instead of a longing for the past, and an undercurrent of resentment toward a society which shifted away from older cultural anchors, this new expression of pride asks, “Why not us?” Then, having asked the question people move to make their dreams realities. In the past few years I’ve seen Palmyra ask the most amazing questions and dream some wonderful dreams. Why can’t we have a drama program? Why can’t our high school’s size be a selling point? Why shouldn’t we have our own farmer’s market? Why should we accept the presence of abandoned properties in our community? What would it take to make our downtown a beautiful place to walk and shop? How can an emphasis on the arts put Palmyra’s downtown back on the map? How can we grow a sense of positive community ownership? How can we celebrate the our heritage and history? These are only the questions I recall being both asked and pursued. There is much more going on in this town, I am certain. The bit going on within my social circles, however, is encouraging. I’ve never before lived in a town when it was perched on the crest of a wave of positive transformation, but Palmyra is there. The borough seems ready to see its potential crash into a powerful breaker. Get ready for an amazing ride!